US, 1952, 122 minutes, Black and white. Robert Taylor, Eleanor Parker, James Whitmore, Larry Keating, Larry Gates. Directed by Melvin Frank and Norman Panama. Above and Beyond is like many of the war tributes of the '50s. It is an M.G.M. production with their customary gloss. It has romance, war training, action sequences. It has Robert Taylor and Eleanor Parker as stars (later to appear together in Many Rivers to Cross and Valley of the Kings). What makes it more significant is that it is a film about the group training to drop the atomic bomb on Hiroshima. The film focuses on Colonel Paul Tibbetts who was the leader of the expedition. The film shows the atomic scientists from Los Alamos and their opinions on the development of the bomb. The film focuses on the atmosphere of the war, the tensions of the time, the decision by President Truman to drop the bomb ? even though there was no knowledge of the consequences. The climax is the dropping of the bomb and its impact on the people concerned. There is also concern about the consequences and the post-nuclear age. The film is from the point of view of Lucy Tibbetts and so it has a softer tone, making the film something of a 'woman's melodrama'. The film was co-written, produced and directed by the team of Norman Panama and Melvin Frank (who worked together generally on comedies and, from the '70s, each pursued a career, generally with comedies. The story was taken up by the 1980 telemovie, Enola Gay. 1. 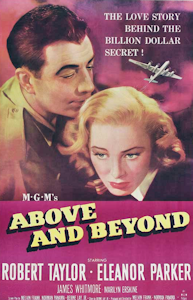 An interesting and entertaining war film of the '50s? Americana? The preparations for Hiroshima? The atomic age? 2. M.G.M. production values: glossy production, black and white photography, the atmosphere of Air Force bases, Air Force training? Domestic melodrama? The build-up to the dropping of the atomic bomb? The montage and special effects for the Hiroshima experience? 3. The '50s and the point of view on Hiroshima? American optimism and confidence of the time? The plans for the bomb drop? Los Alamos and the scientists? Weapons and their development? Deterrents? Hopes? The significance of the theories as explained in the film, the tests, the lack of knowledge of the consequences? The presumptions about the dropping of the bomb: saving lives, deterrents? The focus on God, prayer before the mission? The costs? Truman's decision? Tibbetts' decision? The film produced in the atmosphere of East West tension and the cold war of the '50s? 4. The '50s and the retrospect on the dropping of the bomb? The dialogue in the film about Tibbetts' decision? One button to kill thousands? The fact of the war? The fact of arms development? The American religious perspective? The lives to be lost? The experience of dropping the bomb, the shock of the explosion and the mushroom? The collage of the men's faces in reaction to the drop? Tibbetts' comments on the world being changed forever? The interview on how he felt ? and his retort about how the victims felt? The film's stance on the atomic bomb, its being dropped, the consequences? 5. The structure of the film: flashback, Lucy’s voice-over, the anxiety of the marriage relationship and its break-up? Counterpointing with the seriousness of Hiroshima? 6. Robert Taylor's performance and presence as Paul Tibbetts: his skills, the clash with Major Roberts, his getting on with the job, concern about his men, being commissioned by General Brent, the training of the men, the procuring of necessities, security, the team? The B29s? His personal anguish, tough stances? Listening to the experts? Knowing he had to make the hard decisions? The clash with Roberts about requisitions? Brent's accident and being in hospital? His friendship with Major Uanna? The decision to go ahead? The mission, the timing, nerves, fears? The decision to call the plane after his mother? The letter to his mother and his fears? The aftermath ? his military decorations, his stern appraisal of the experience? 7. The domestic story: the love between Paul and Lucy, the birth of their children, friends? The distance, the hurt, the passing of the years, stricter security, Lucy trying to break through, the new house, sequences at home, the children, the effects of the separation and the secrecy? The decision to separate? 8. Lucy in herself, her love for her husband, the birth of the children, the home, the secrecy and her puzzle, trying to break through, having to cope? The listening to the radio, the media people bursting in on her? The final reconciliation? 9. Major Vanna and his job, security, not being able to help Lucy? 10. The men in training, the testing of their security and many of them failing and the reprimands? Marge and Harry and Paul's disciplining Harry? 11. The film as a war film, a war training film? A '50s American tribute to the heroes of World War Two? 12. The retrospect from later decades on the nuclear themes, focus on the realities of the '40s? Interpreting them? Wisdom after the event?